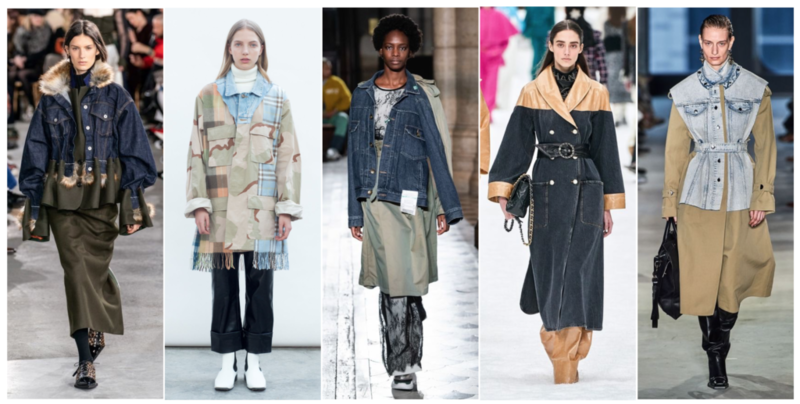 From the tough all-American workwear to the new working wardrobe of the modern woman, there was an all-round feeling across A/W 19 shows for the need for clothes that you can really get to work in. Sophisticated tailoring and timeless staples rooted in a pragmatic and functional attitude were very much front and center in everyone’s minds this season – both on and off the catwalk. This wasn’t about runway dramatics or stagey garments of any kind, rather clothes for daily life: trenches, pantsuits and practical yet distinctive denim. There was a sense that pieces will serve their wearers, not the opposite way around. Sweeping volumes and minimalist palettes directed a new mood in quiet luxury, while a general smartening up has now become a fully acknowledged look in the general trend conversation. Perhaps consider it a neat palate cleanser after seasons and seasons of sportswear. 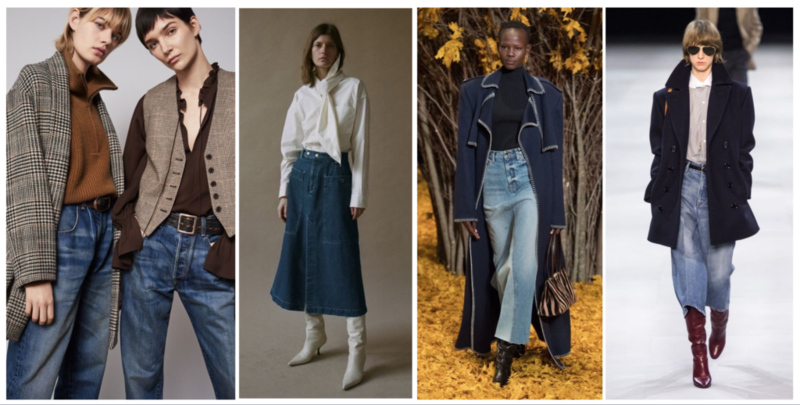 Check out our below seasonal trends and all the denim-related looks of the season on our pinterest board. While American workwear will always have its place in Blue Collar basics, the rugged utility style has long since transcended its initial use of function. On the catwalk, designers like Heron Preston, Landlord NYC and R13 have been helping to establish workwear as the uniform of the youth, just as the skaters, rappers and grunge rockers did in the 90s. This isn’t about being able to know how to operate a bandsaw (or even know what one is) to dress “authentically” in workwear; it’s about subcultural knowledge and subverted designs that give these classics relevance for a new generation. 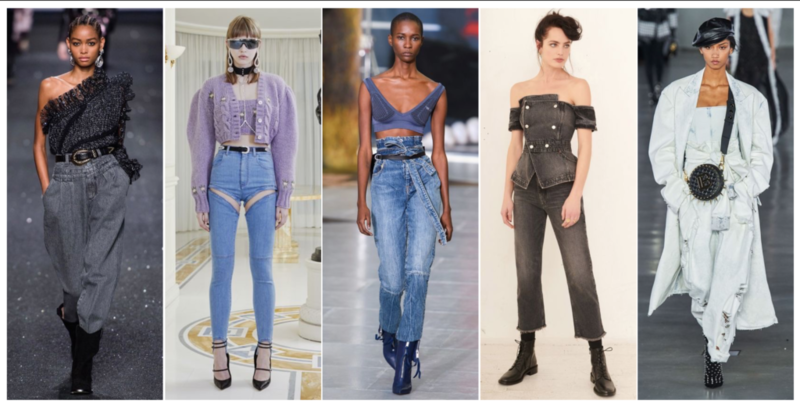 Simple, paired-back casualwear design met the high-fashion luxe of the runway this season, as designers tapped this youthful yet elevated denim story. 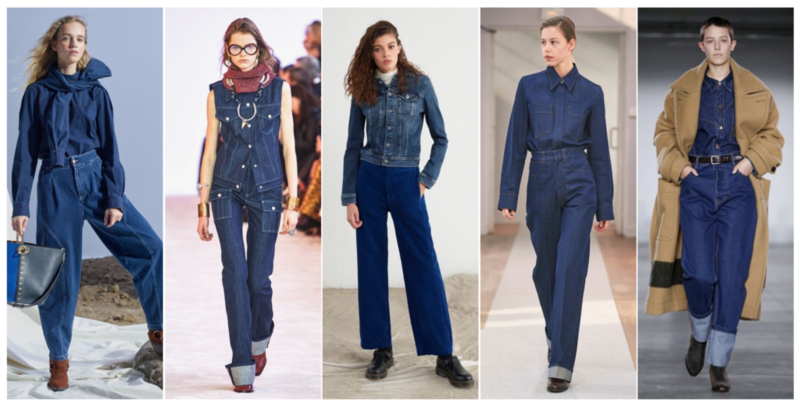 The use of volume, pleating, folding and seaming transformed classic pieces into gen-z-friendly denim. Drawing from modern nostalgia, influences ranged from 80’s casualwear classics to rave culture and even sci-fi (at Ottolinger) but the result was the same: street-luxe for a new generation of luxury consumer. Hedi Slimane took a sharp pivot from the ’80s glamour he delivered for his debut season at Celine, instead showcasing a haute bourgeois vision that referenced the original roots of the Parisian label as laid out by its founder Céline Vipiana. Phew. 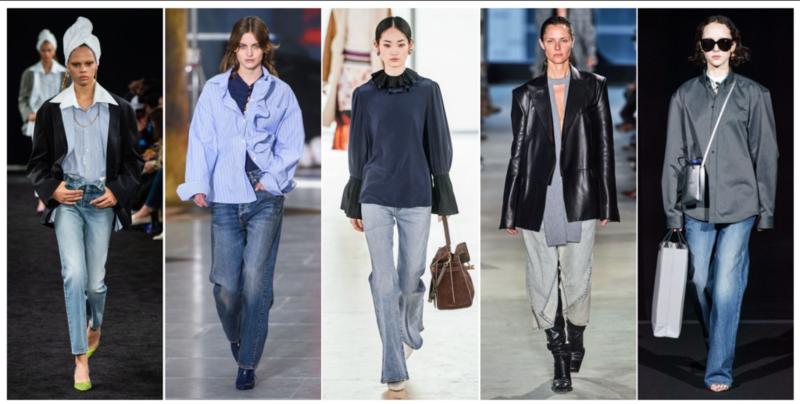 Silk blouses, country tweed, pleated culottes and vintage denim proved a resounding winner with women the world over. This 70s bourgeois revival (the Parisian kind) was felt across the season with designers like Sea, Khaite and Nili Lotan driving a sentiment of separates-based dressing that celebrates personal taste over a single must-have item. 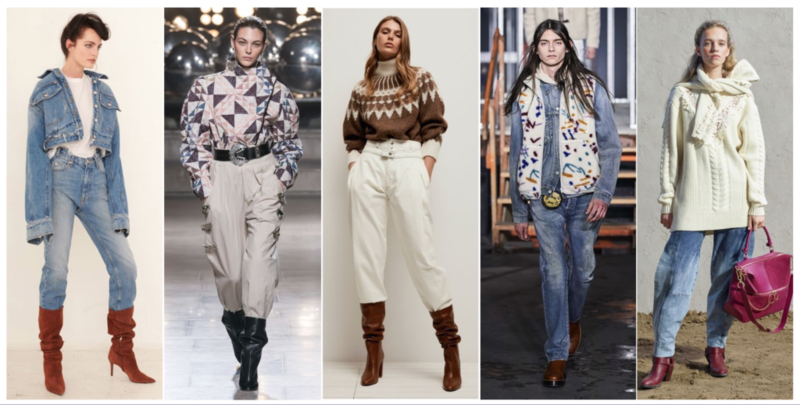 This included retro shades of brown, Prince of Wales checks and late 70’s ‘mom denim’ silhouettes: a look you’d typically expect a middle-class lady to wear on a weekend jaunt in the country. 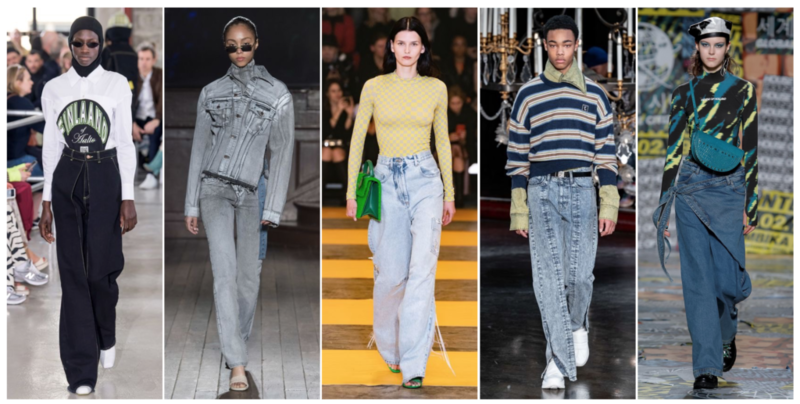 Last season saw an emergence of acid washes, high waists and almost costume-like replicas of the heady days of 80’s denim. But some of our favourite FW19 shows took a softer approach to the decade, designed through the lens of sophisticated, Ralph Lauren-esque Americana. Whilst strong shoulders with loose, high waisted fits remained, this new iteration spoke more ’80’s mom’ than 80’s pop star. A strong prairie influence informed the American quilts and oversized belt buckles at Isabel Marrant and the subtle rodeo attitude at John Elliott. But mid-calf stacked boots, chunky sweaters and practical fleeces gave the look that touch of 80’s irony to make this a story steeped in nostalgia. Despite the segway into everyday Americana, the 80’s were still prevalent in all their glamorous glory. Body-con bralets, off the shoulder ruffles and nipped-in waists remained a strong look for the day-to-night denim gang. Aggressive and high-contrast laundries remained key and double-waisted details hammered the 80’s aesthetic home. Balmain were one of the key drivers of this look last season and took the opportunity to take things a step further with barely-there bleach-outs and fierce, layered 80’s styling. Tailoring and a move towards clothing that empowers the modern working woman has been one of Fall’s most resounding messages. This forward-thinking mentality has driven designers to take a more serious look at dressing this season, with which is not surprising during such a critical time of political uncertainty that looms with Brexit and the ongoing instability of the Trump administration. And lets admit it, a starchy pantsuit just isn’t going to cut it for todays women in power. Balenciaga’s Demna Gvasalia and Proenza Schouler’s Lazaro Hernandez and Jack Mccullough both imagined this new version of femininity through a quietly powerful business casual style that were grounded in sharply tailored shirts and jackets. Bold shoulders and full-leg pants featured throughout. Just don’t call them menswear-inspired. This season, many designers continued to translate Phoebe Philo’s vision of grown-up, professional clothes for grown-up, professional women. This discussion of the female gaze and the working wardrobe of what women really want to wear has driven designers to take a more serious look at dressing this season – one that places pragmatic but chic wardrobe staples at the top of the list. 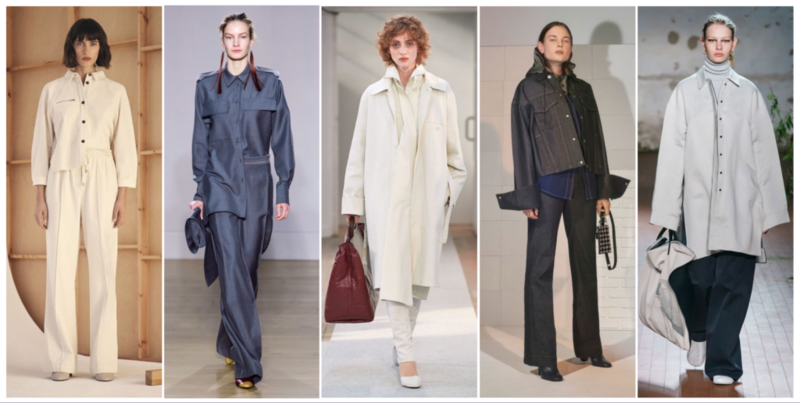 At Lemaire, Balenciaga and Jill Sander, unstructured weightlessness, simplistic silhouettes, weighty denim and future-proof pieces reigned supreme, while Lacoste, X and X proposed neutral updates on classics with a few little twists to keep things interesting. Hybridization has been a much explored concept over the past few seasons and it showed no sign of slowing for A/W 19. The blueprint for fusing contrasting garments was laid out by visionary designers like Martin Margiela in the 90s, but its relevance still resonates in todays climate where we are demanding more and more from our wardrobe essentials. Designs from the likes of Maison Mihara Yasuhiro follow on from that of Balenciaga and Y Project, with odd pairings of truckers embedded into macs, while Proenza Schouler designers take a more practical approach where these seemed to be two separate pieces, which could lend them a potential versatility. In an uncertain world, the concept of fashion as armour has reached new levels with protection gear being the new go-to. 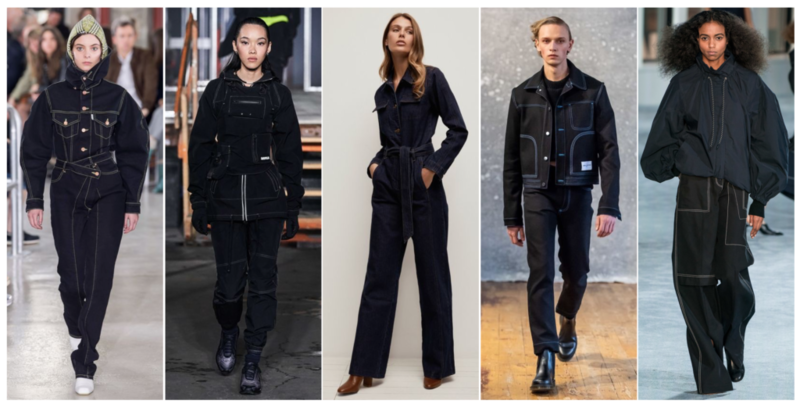 Brands like Alyx, Calvin Klein and Heron Preston have ushered on a new uniform for the street in the form of utility rig vests, fireman coats, and sturdy utilitarian jackets that are now commonplace in the trend conversation. 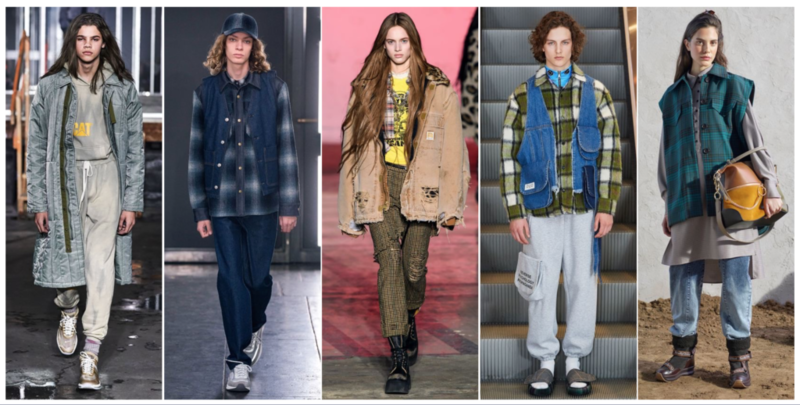 Designers continue to refine this look on the runway with pristine takes on typical Carhartt style garb like denim boiler suits, combat trousers (a style that has been out of fashion long enough to make a return), coveralls and utilitarian jackets. Rigid black denim accentuated with contrast topstitching (triple or double for maximum effect) gives this look a truly wearable style thats just as right in the street as it is in the workplace. As uncertain weather patterns continue to effect our lives, the concept of a more functional future became a strong theme for winter 2019. Retro-modern skiwear and arctic-ready silhouettes give this story a future-nostalgia feel; the familiar comfort of stone-washed jeans and down jackets were elevated using technical fabrics and streetwear silhouettes. Moncler played with tie-dye finishes to give their ultra functional garments a kaleidoscopic hippie trip, and despite the practical inspiration behind these looks, fashion was very much at the fore. A sea of rich and vibrant red-cast indigos with a late 70’s/ early 80’s feel dominated the runways this season, making this retro blue the key indigo shade of the season. 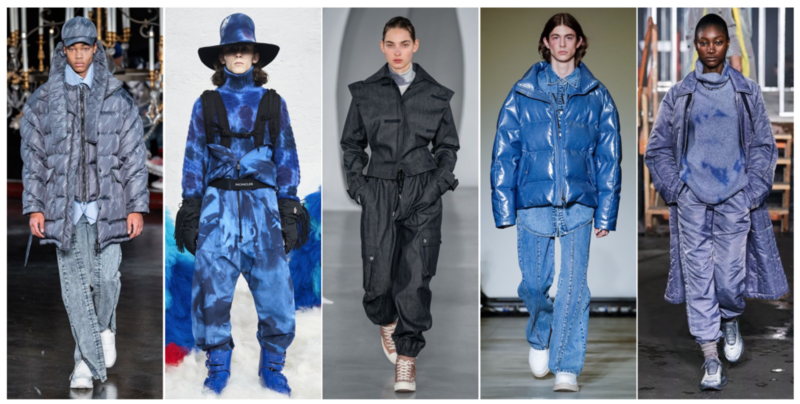 Alex Mullins, Chloe and Lemaire sent total-look blues down the runway in rinsed or unwashed denims, making a fresh, bold statement. 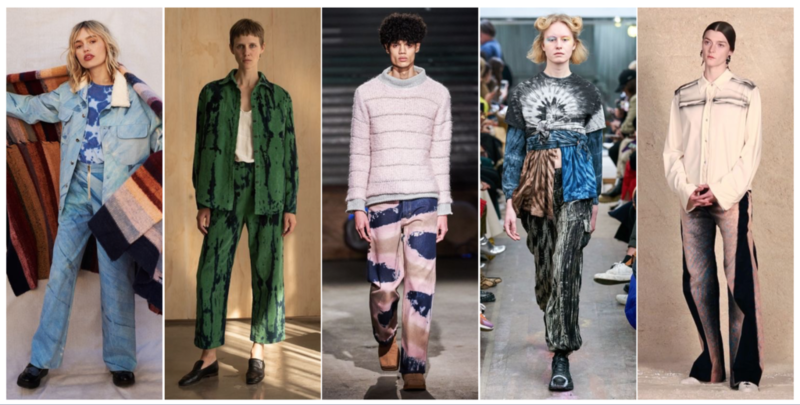 Tie-dye emerged as a fashion influencer favourite for summer 2018, and it’s a look that was cemented on S/S 19 catwalks (as we highlighted last season). For Winter 19 designers refine the technique with more sustainably minded applications like digital prints as an eco-alternative to typical water and chemical intensive dyes. There’s also an exploration of more artistic effects like painted brush strokes, aerosol sprays and delicate shibori patterns to create kaleidoscope versions. NYC brands lead the pack with a wave of fresh colours that help lift the otherwise clean-slate of colour across winter catwalks.